There are days when long walks are rewarded with great views, and then there are other days. This day most definitely fell into the latter category. As we climbed from Winspit up to St Aldhelm’s Head (also known as St Alban’s Head) the spectacular geology and views of the Jurassic Coast eluded us completely. Mist. It rolled in from the sea, curled up the cliffs, and swept inland. There, within a couple of hundred yards, its incursion was halted by the sun. It was dissipated by the lightest touch, evaporating into the bright blue of a gorgeous day. We could see it all happening. We could see it was a perfect spring day a hundred yards inland – it just wasn’t where we were! We hoped the mist would clear, but it just kept rolling in, all day. I tried to look on the bright side. Because of the mist there was no horizon to be seen, so I would not have to straighten any of my photos today (coastal photographers reading this have empathetic smiles on their faces right now). St Aldhelm’s Head is the most southerly point of the Purbeck peninsula. 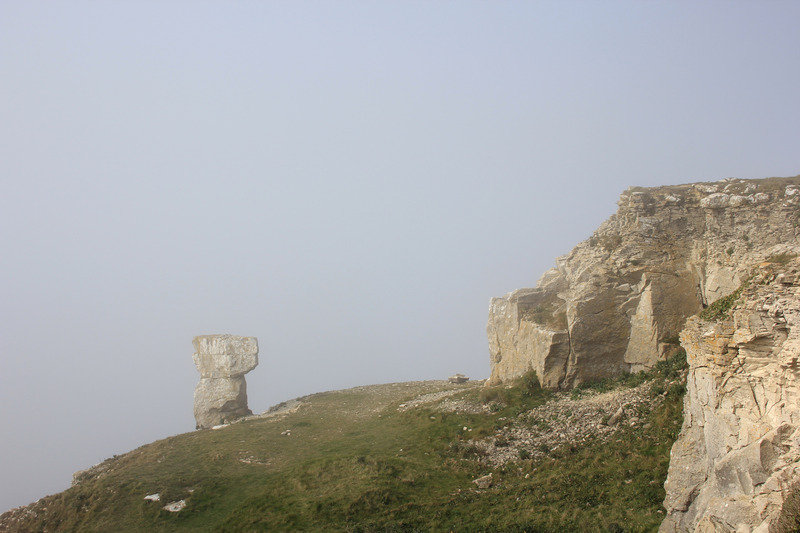 As we approached it we saw a pillar of Portland Stone, teetering on the cliff edge and gazing out to sea, standing as a defiant reminder to the fact that this place was once heavily quarried. Beneath it, leading down to the sea’s edge, was a landscape littered with other boulders, perhaps fallen from an eroding cliff edge but perhaps discarded by the quarrymen years earlier. The pillar was actually quite large (and quite stable, though it may not look it). How many years this pillar has stood here I do not know. I wonder how many more years it will remain before finally toppling and joining the other boulders on the slope below? Just inland from this pillar we found a sculpture commemorating the importance of St Aldhelm’s Head to the development of radar. During World War Two radar was cutting-edge technology and top secret. Research into it had started some five years before the outbreak of war, in Suffolk, but that was too close to Germany and so Churchill decided to relocate operations to Worth Matravers in Dorset. 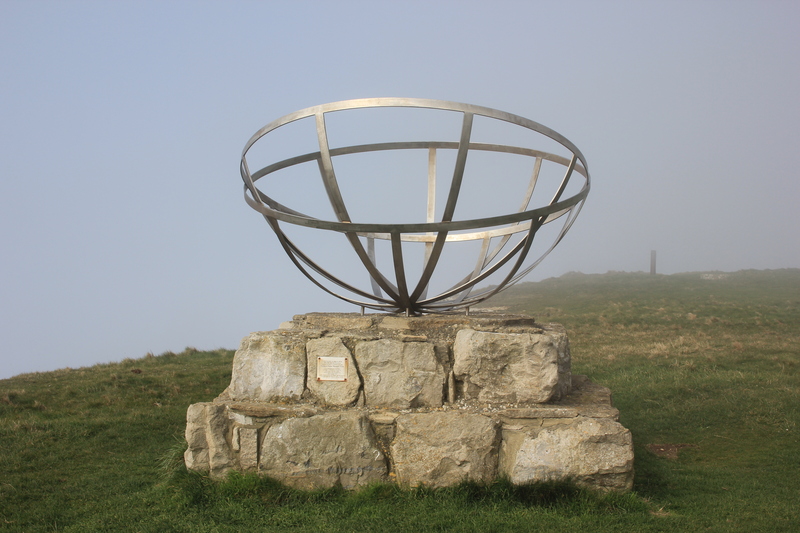 St Aldhelm’s Head was the site of an experimental radar station, specifically a Chain Home Low (CHL) radar. CHL radar was designed to detect aircraft flying at altitudes below the detection capabilities of the existing Chain Home radar. The St Aldhelm’s Head station demonstrated that high, cliff-top locations were much better for CHL radar than low-lying positions. As a result a fully operational station was then built here. In 1942 Churchill feared a German attack on the south coast and moved operations to Malvern in Worcestershire, but from 1940 to 1942 the research at St Aldhelm’s Head was of critical importance to radar capability and the war effort and generally. 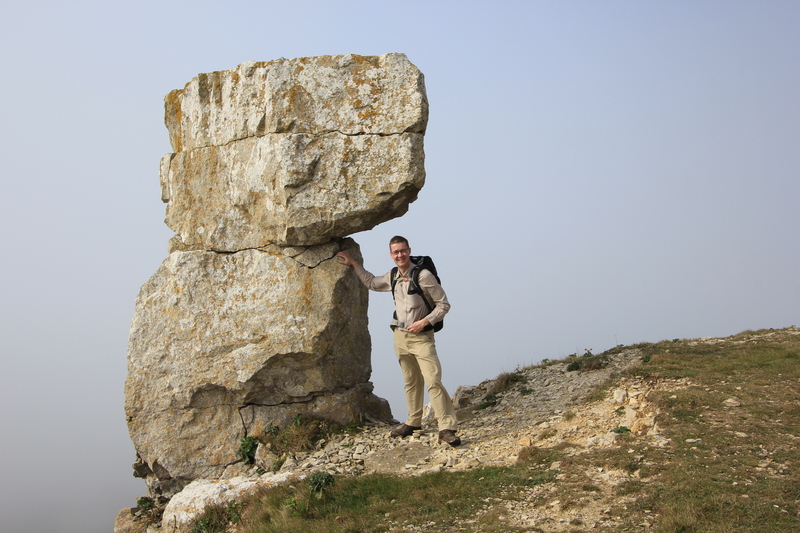 St Aldhelm’s Head itself is named after (yes, you guessed it!) St Aldhelm. St Aldhelm was the Bishop of Sherborne and died in 709 AD. Stood on the head is a tiny Norman Chapel named after him, standing just under 8 metres square. We found it isolated and mysterious in the gently enveloping mist, its door open and beckoning. 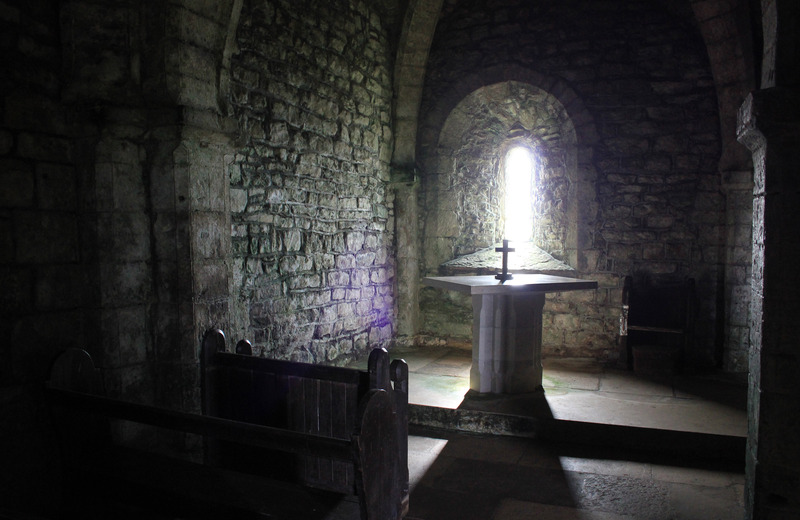 The first record of the chapel dates to 1261 but it is believed to date to as early as 1140 when, according to one story, a daughter and son-in-law to a local family drowned; the family erected the chapel in remembrance. Over the centuries it fell into ruin, but is now restored and fully functional. It is a tiny building compared to the many churches found in so many towns and villages, serving only a small terrace of coastguard cottages lying nearby. But for all that, it is a simple, peaceful place to visit. Compared to the pomp and grandeur of other places of worship I imagine this small, sparse chapel operates more on simple faith alone and surely there is much to be said for that. 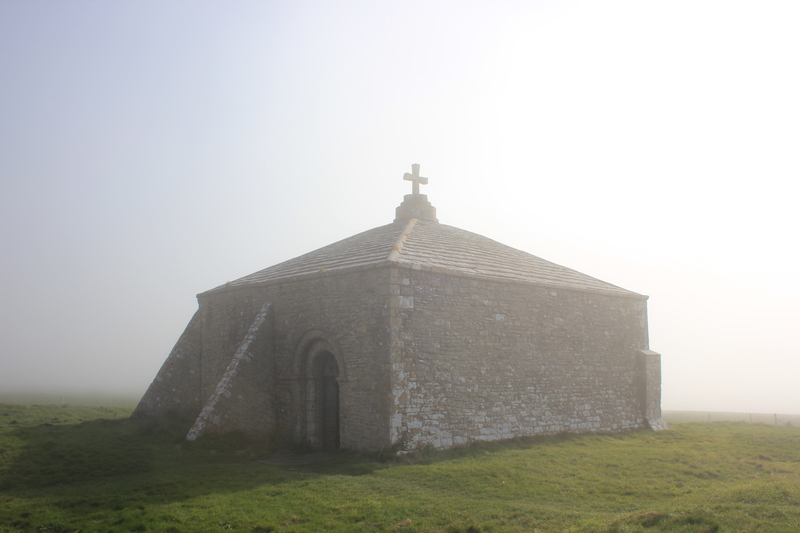 This entry was posted in Dorset and tagged chapel, coast, Dorset, fog, mist, radar, St Alban's Head, St Aldhelm's Head, travel, walking. Bookmark the permalink. Wonderful atmospheric images of the chapel. So frustrating isn’t it when you get a mist like that and you only have to go a few metres inland and it’s a lovely day. It’a a shame as there are some good views here and I’m glad you got to see that chapel. Then there is that horrible bit ahead, where the path goes right from the cliff top all the way down some steps to sea level, then immediatly back up again. Not that uncommon on the South West Coast Path, but this one the cliffs looks flat until you are nearly there, then you see it! Yes, that was a bit of a killer – not helped by the fact that all the way down we had perfect views of the all-the-way-back-up bit! Thank you – your words and pictures make ‘mist’ come alive. Sadly I’m one of the coastal photographers who have trouble with horizons. The islands off Saunders Beach change each day and I’m thrilled when a photo comes out just right. 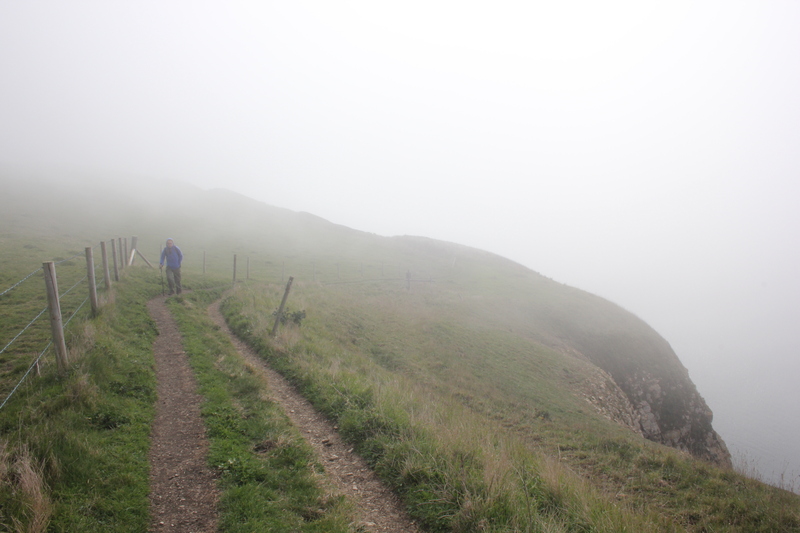 other side of trail – especially given the weather! We were betting the same, Jill! We never found out whether we won our bet because the mist never cleared! !